Landscaper vs Lawnscaper…Know the Difference! What may not be obvious here is the need for the perfect timing of each trim to ensure maximum color all year. Trimming is done by hand, not by hedgers. A person who does not understand the growth pattern of these plants could do some real damage or prevent any color from showing. This is a relatively hostile rant as I have about hit my limit of “my landscaper did this” comments. Over the years while providing consultations and meetings with perspective clients the term “Landscaper” has been used far too loosely. Interestingly enough they are now calling ME to help with (note the hostility) the mistakes the previous or current “lawnscaper” has made. This is frustrating and offensive as I am a professional who is trained formally and practically in my field, but equally concerning is that otherwise really intelligent and successful people trust one of the most important aspects of their lives, (their yard) to a not so qualified Lawnscaper. What is a “Lawnscaper” you ask? it is a word primarily used for companies who focus on lawns and while they may skillfully push a lawnmower, edge, blow, and maybe even mulch, but may have no idea about plants. (noting more hostility?) Would you go to a plummer for your skin condition even if they had some ointment? Would you hire your dentist to do a plant design for you? I think not…sooo why are you assuming a guy or gal who owns a lawnmower and maybe even a fancy shovel or two take care of your landscape plants and trees? I know, it is a good question…That is not to say that people who are truly “landscapers” don’t sometimes stink at what they do, but there is an important distinction here. The biggest problem in my particular field is that people who do not have the skill set but need the money and frankly do not care about your long term issues, will take work they are not qualified to do, and the people who hire them are not checking their credentials. If the person you are hiring cannot name the first three to five plants you point to, have them mow your lawn, and call a landscaper for your plant work. That being said, just because someone knows plants does not mean they know design, has ever seen those plants growth patterns or can understand the seasonal aspects (dormancy, flowering time, water needs, etc) of the plant selection they may choose. Do they know or care that the Weed and Feed they are throwing down can kill your trees, lawn and shrubs (not to mention your pets). Chemical fertilization at the wrong time and wrong rate of application can kill your lawn and applying too much can kill the planet. Organics are safer, no more expensive in most cases, longer lasting and vastly more beneficial in every way when applied correctly. Chemical fertilizers make your plants and lawn dependent on them and are toxic to our air, water and soil. Organics when used correctly strengthen the symbiotic relationship between your plants and soil. Live Oaks are a Texas landmark. Improper trimming of Oaks can kill or permanently damage a huge asset to your home and to the planet. The improper trimming of any tree can cause permanent damage and disease and improper mulching to any tree can also create a haven for pest and disease. A properly trimmed tree should look natural and an educated tree trimming protocol should always be used. 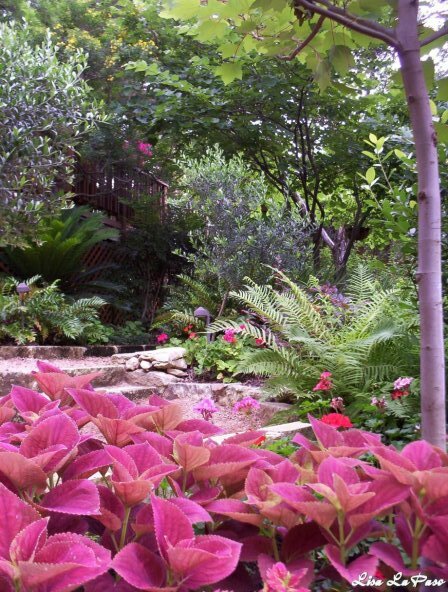 There are tons of really qualified professional Gardeners, Landscapers and Landscape Designers and lawnscapers here in Austin Texas and it is going to take some time to research a qualified person to get the job done right. Well worth the time and effort when you consider the ramifications of the expensive mistakes an uneducated person could make to a mature tree or expansive landscape. Anyone who has ever read my blog knows how I feel about Organics, but with all of the many organic solutions out there, does your lawnscaper practice these or are they looking for the “quick fix” that does wayyyy more harm in the long run because they have no organic knowledge? Do you know that most organic practices take years sometimes to see the full results, but that your water bill reduction and plant health will be almost immediate? Most companies now a days will charge you the same rate for it and with all the knowledgeable, qualified, educated professionals in Austin, why are you taking short cuts? Trimming Topiaries is an art form. Cutting the wrong branch or stem can take the plant years to recover from. Another important consideration when hiring a lawnscaper/landscape is whether or not it is a legal business. If the person or persons you hire are not paying taxes (Federal and Sales here in Texas), they are making legitimate companies and small businesses pay less to their employees and make less profit to live from to compete and these people cannot be found when something goes wrong. If your immediate thought is “who cares if it’s cheap”, I am not going to change your mind anyway, but if this is something you had not considered, this might be a good time to do so. I will again say that there are PLENTY of tax paying, legitimate companies who do shoddy work, but that is where your homework and research will pay off. Just because they can push a mower does not a landscaper make…Companies and small businesses who are about the consumer want to do the right thing by you and they should take pride in telling you, we do not do that, I do not know that, or let me find out and get back to you. If the company you use is referred to you from a satisfied customer, all the better. You may need to find two or more companies to meet all of your needs. For example I do not mow lawns but I can tell you how to care for them…That is where a professional landscape consultation can be your friend. If you know what needs to be done and when, you can help educate your lawnscaper or landscaper to work better for you. I have been told over and over again that “my landscaper” always trims those bushes wrong, trimmed my trees wrong, planting things too close together, applied too many chemicals, the wrong time and on and on. THAT MEANS THEY DON’T KNOW WHAT THEY ARE DOING! In the words of a good friend of mine, “fool me once, shame on you, fool me twice, shame on me”. That applies here. Dark, nutrient rich soil is another area that most “Lawnscapers” do not understand. That orange dirt they paid $10 bucks for may have made them a healthy profit, but it just cost you and your landscape a fortune. Compost can save the world! Change your dialog with your lawnscaper/landscaper and interview them for the job, just like any employer would. Ask for references, look them up online, have a running dialogue that lets you know they understand your needs, they understand your vision and they understand what the heck THEY are doing. Keep a close eye on how things are going and when they show you who they are, believe them…If you have a good one, pay them well and refer them often as we are a dying breed. No go get your landscape on! Here is an important one people, if you did not read it the first time, take a few moments this morning to do so…it could save you a lot of money and frustration. Landscaping is a significant investment and worth doing right, design, construction and maintenance. Sometimes saving a few bucks costs you a lot more in the end. Right on! So glad I found this! Great! I think I;ve said a few things like this about what happens to the large, more commercial landscapes I’ve designed…and tough to fit in time to talk to the owner to put a stop to it. But tougher to hear the architect who hired you justify the mow-blog company’s actions.